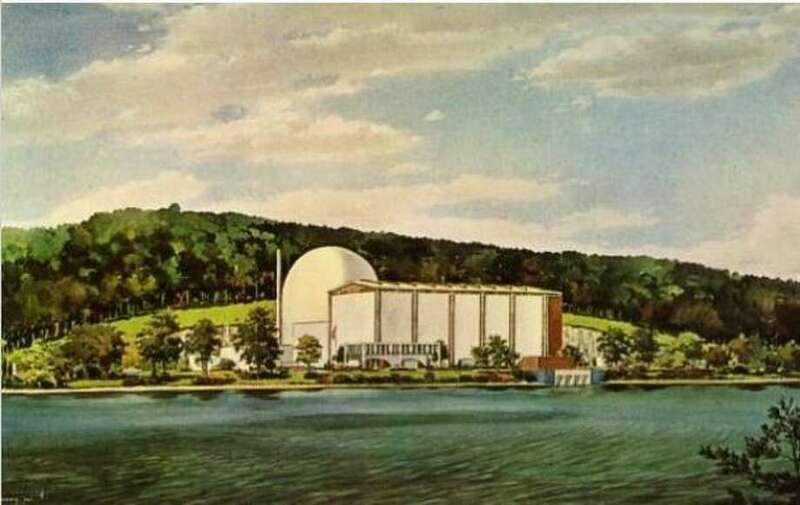 Artist’s rendering of the Connecticut Yankee Power Company Plant, Haddam Neck. Postcard published by the Connecticut Yankee Atomic Power Company, ca. 1968. Connecticut Yankee Nuclear Power Plant, the state’s first nuclear power plant located in Haddam Neck, Connecticut, was commissioned in January of 1968. It ceased electricity production in 1996, and was decommissioned by 2004. The plant had a capacity of 582MW. Demolition of the containment dome was completed the week of July 17, 2006 and nearly a 1,000-plus spent nuclear fuel rods remained in Haddam Neck stored in steel-reinforced concrete casks, according to published reports. The entire Connecticut Yankee property is about 500 acres. The plant owner, Connecticut Yankee Atomic Power Co., must still maintain a federal license for five acres on the site to cover a dry cask storage facility. That is where the 1,000 spent nuclear fuel rods that contain uranium are stored. Connecticut Yankee must maintain $100 million in nuclear liability insurance for the storage until the waste has been removed.